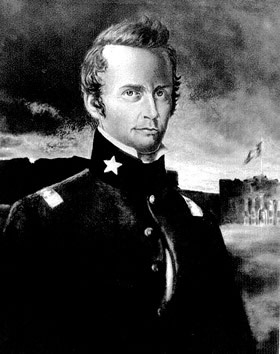 William Barrett Travis was not destined to be a hero; in fact, he could be described as something of a scoundrel. The details of his short life are available in any comprehensive history of the Texas Revolution. But in early 1836, Travis rose above his troubled past and became a legend in the history of Texas and the Texans. Given command of the small detachment at the Alamo in San Antonio de Bejar as Santa Anna's Mexican army approached, Travis had to deal with the likes of Jim Bowie, Davy Crockett, and almost 200 other Texas revolutionaries—a challenge in itself. He made a fateful decision for himself and those who chose to remain with him, namely, to fight to the death regardless of the odds. He was 26 years old when he died at the Alamo. As Santa Anna's army approached, Travis sent out a famous appeal for help. That letter and one other are presented below. Feby. 24th, 1836 (MS; Archives, Texas State Library, Austin). I am besieged, by a thousand or more of the Mexicans under Santa Anna - I have sustained a continual Bombardment & cannonade for 24 hours & have not lost a man - The enemy has demanded a surrender at discretion, otherwise, the garrison are to be put to the sword, if the fort is taken - I have answered the demand with a cannon shot, & our flag still waves proudly from the walls - I shall never surrender or retreat. Then, I call on you in the name of Liberty, of patriotism & everything dear to the American character, to come to our aid, with all dispatch — The enemy is receiving reinforcements daily & will no doubt increase to three or four thousand in four or five days. If this call is neglected, I am determined to sustain myself as long as possible & die like a soldier who never forgets what is due to his own honor & that of his country - VICTORY OR DEATH. P. S. The Lord is on our side - When the enemy appeared in sight we had not three bushels of corn - We have since found in deserted houses 80 or 90 bushels and got into the walls 20 or 30 heads of Beeves. From Mary Austin Holley, Texas (Lexington, Ky., 1836), 351-353. Sir, - In the present confusion of the political authorities of the country, and in the absence of the commander-in-chief, I beg leave to communicate to you the situation of this garrison. You have doubtless already seen my official report of the action of the 25th ult., made on that day to Gen. Sam. Houston, together with the various communications heretofore sent by express. I shall therefore confine myself to what has transpired since that date. From the 25th to the present date, the enemy have kept up a bombardment from two howitzers, (one a five and a half inch, and the other an eight inch,) and a heavy cannonade from two long nine pounders, mounted on a battery on the opposite side of the river, at the distance of four hundred yards from our walls. During this period the enemy have been busily employed in encircling us with entrenched encampments on all sides, at the following distances, to wit: -in Bejar, four hundred yards west; in Lavilleta, three hundred yards south; at the powder house, one thousand yards east by south; on the ditch, eight hundred yards northeast, and at the old mill, eight hundred yards north. Notwithstanding all this, a company of thirty-two men from Gonzales, made their way into us on the morning of the 1st inst., at 3 o'clock, and Col. J. B. Bonham (a courier from Gonzales) got in this morning at 11 o'clock, without molestation. I have so fortified this place, that the walls are generally proof against cannon balls; and I still continue to intrench on the inside, and strengthen the walls by throwing up the dirt. At least two hundred shells have fallen inside of our works without having injured a single man: indeed, we have been so fortunate as not to lose a man from any cause; and we have killed many of the enemy. The spirits of my men are still high, although they have had much to depress them. We have contended for ten days against an enemy whose numbers are variously estimated at from fifteen hundred to six thousand men, with Gen. Ramier Siesma and Col. Batres, the aids-de-camps of Santa Anna, at their head. A report was circulated that Santa Anna himself was with the enemy, but I think it was false. A reinforcement of about one thousand men is now entering Bejar from the west, and I think it more than probable that Santa Anna is now in town, from the rejoicing we hear. Col. Fannin is said to be on the march to this place with reinforcements; but I fear it is not true, as I have repeatedly sent to him for aid without receiving any. Colonel Bonham, my special messenger, arrived at La Bahia fourteen days ago, with a request for aid; and on the arrival of the enemy in Bejar ten days ago, I sent an express to Col. Fannin, which arrived at Goliad on the next day, urging him to send us reinforcements—none have yet arrived. I look to the colonies alone for aid: unless it arrives soon, I shall have to fight the enemy on his own terms. I will, however, do the best I can under the circumstances; and I feel confident that the determined valor, and desperate courage, heretofore evinced by my men, will not fail them in the last struggle: and although they may be sacrificed to the vengeance of a gothic enemy, the victory will cost the enemy so dear, that it will be worse for him than a defeat. I hope your honourable body will hasten on reinforcements, ammunition, and provisions to our aid, as soon as possible. We have provisions for twenty days for the men we have— our supply of ammunition is limited. At least five hundred pounds of cannon powder, and two hundred rounds of six, nine, twelve, and eighteen pound balls— ten kegs of rifle powder, and a supply of lead, should be sent to this place without delay, under a sufficient guard. If these things are promptly sent and large reinforcements are hastened to this frontier, this neighborhood will be the great and decisive battle ground. The power of Santa Anna is to be met here, or in the colonies; we had better meet them here, than to suffer a war of desolation to rage in our settlements. A blood red banner waves from the church of Bejar, and in the camp above us, in token that the war is one of vengeance against rebels: they have declared us as such, and demanded that we should surrender at discretion, or that this garrison should be put to the sword. Their threats have had no influence on me, or my men, but to make all fight with desperation, and that high souled courage which characterizes the patriot, who is willing to die in defence of his country's liberty and his own honor. The citizens of this municipality are all our enemies except those who have joined us heretofore; we have but three Mexicans now in the fort; those who have not joined us in this extremity, should be declared public enemies, and their property should aid in paying the expenses of the war. The bearer of this will give your honorable body, a statement more in detail, should he escape through the enemies lines- God and Texas--Victory or Death! P.S. The enemies troops are still arriving, and the reinforcement will probably amount to two or three thousand.